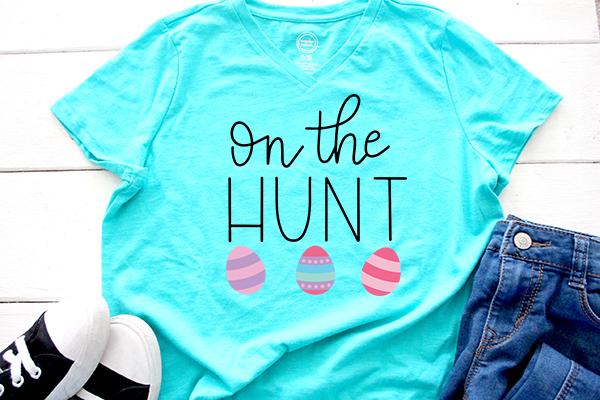 This hand lettered Easter egg hunt cut file is the perfect solution for all your Easter fun! When my kids were little, I loved dressing them up for holidays so they matched. Unfortunately, when you have both a boy and a girl, this doesn’t always work out so well. So I would do my best to color coordinate them so I could take a gazillion adorable pictures. Now that they are older, they want absolutely nothing to do with dressing matchy matchy with their sibling. Imagine telling a middle school girl that she needs to match her outfit to her little brother. That doesn’t go over very well in our house. But if you DO happen to have young children… you’re going to love my hand-lettered Easter egg hunt cut file. It’s perfect for creating matching shirts (for boys AND girls) and would look great on a bucket or a bag. If you are not familiar with cut files, you may want to first read this post about how to use SVG files. SVG stands for scalable vector graphic and it is the format that most cut files come in. 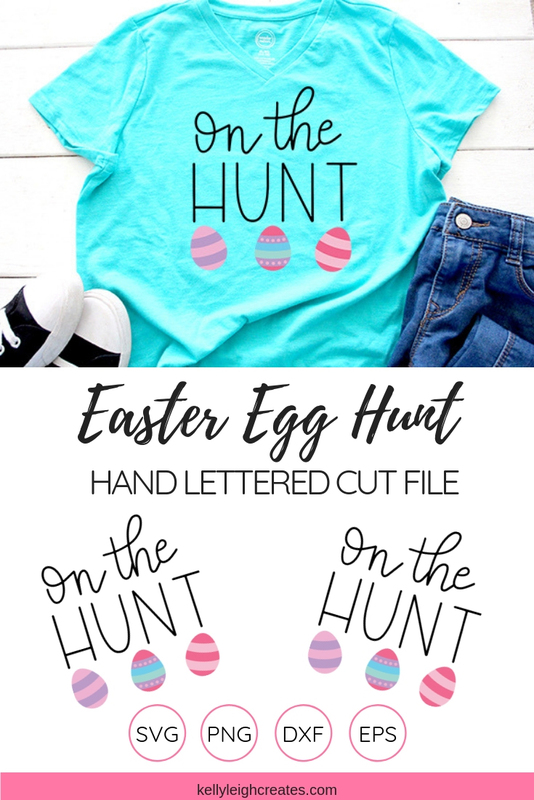 In addition to SVG format, I’m also offering the Easter egg hunt cut file as a DXF, EPS and PNG. If you would like to make a shirt like the one shown above, here is what you will need. Download the free egg hunt cut file. You can access it in the resource library. The resource library is password protected and available to email subscribers only. If you are not on my email list, you can sign up below. Using your Silhouette or Cricut, cut out the file using heat transfer vinyl. Make sure to mirror the cut file before cutting. My favorite heat transfer vinyl (HTV) is Siser Easyweed. I find that it sticks really well and holds up well in the wash. I like to use this brand of HTV for all my projects. If you want your design to look like mine, you will have to cut multiple colors of vinyl and layer them onto the shirt. I highly recommend using an Easy Press to adhere your design because it heats more evenly than an iron and you will get better results. WANT TO USE THIS FILE WITH REGULAR VINYL? CHECK OUT THIS POST ON HOW TO LAYER ADHESIVE VINYL. No. You must have Silhouette Designer Edition to open SVG files. If you have Silhouette Basic Edition, you can only open STUDIO files and DXF files. STUDIO files are specific to Silhouette. Yes. Any SVG file can be used in Cricut Design Space. How do I cut different layers in different colors? If you want your finished product to contain multiple colors of vinyl, read this post to learn how to cut layers with the Silhouette.